Jim Hackett responded forcefully to a New York Times report about harassment at two Chicago plants. Hackett’s task has been to reset Ford story for Wall Street, but the reality of the auto industry is hampering his efforts. He has no choice but to deal with the challenge of pointing Ford to the future without undermining its profitable past. When Jim Hackett took over as CEO of Ford from company veteran Mark Fields in May, the carmaker effectively split in two. Hackett’s main job, under the watchful eye of Ford Chairman Bill Ford, was to reset the company’s story in an age of Tesla and Uber. Prior to becoming CEO, Hackett had overseen Ford Smart Mobility, the carmaker’s futuristic initiative, and before that as CEO of Steelcase had forged a good relationship with Silicon Valley and the tech world. But Ford needed to keep the core business on track; amid of boom in US sales, the hot-selling F-Series pickup trucks needed to keep rolling off dealer lots. For that, Ford tapped two experienced executives, Joe Hinrichs and Jim Farley. Hackett is now trying to do for Ford in 2017 what Alan Mulally did when he was CEO before the financial crisis: craft an inspiring mission statement that will captivate the entire company, Wall Street, and the naysayers who think that Tesla’s surpassing of Ford in market capitalisation this year was more than symbolic. Over the past six months, Ford stock in up over 10%, but it still lags the broader market and its peers. 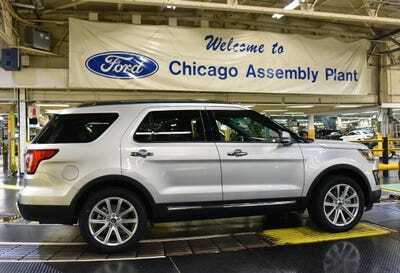 FordA Ford Explorer produced at one of the Chicago plants. I’ve been in business for too long, though, to believe you can create a great culture simply through a top-down dictate. While it’s vital that the values of the company are unambiguous and start at the top, this cascade of values needs to permeate every employee’s consciousness. And those employees, in addition to management, must make it clear to every new member joining the team what is expected. We’re committed to that absorption. I will be in front of our employees in Chicago when everyone is back from the holidays to let them know that when they leave for work in the morning, they and their families can expect that they are coming to an environment that is safe, respectful and motivating them to do the best job possible. Hackett’s language was very Hackett: determined but also abstract, demonstrating his challenge. The car business, now over a century old, isn’t the tech business (although Silicon Valley has been dealing with its own rounds of dealing with a culture of degradation and harassment). The manufacturing economy is far more sophisticated than it was when workers were banging together Model Ts with hammers, but car plants remain hard places to work. There’s no point in sugarcoating it, and Bill Ford didn’t when I talked with him at the Detroit auto show in early 2017. “This is a tough business,” he said. Yes, there are robots. But there’s also a longstanding sense that you have to prove yourself in a troublingly old-school way to gain respect, and for the women in Ford’s Chicago plants, even proving yourself reportedly wasn’t enough. Hackett is now seeing what a number of other auto execs are dealing with: pressure to reinvent the industry amid what the media has labelled a vast disruption – electric cars, self-driving cars, ride-hailing startups – that might not actually disrupt much at all, but to also maintain the very profitable traditional side of the operation. Ford didn’t amass $US40 billion in liquidity on its balance sheet by forgetting to sell pickups and SUVs so it could plunge headlong into selling electric cars when their sales make up only 1% of the global market. If Ford has way out for Hackett, it’s that the company is, at the base, a family business. Mulally was able to reinforce that and unify the firm. Fields took up the baton but ran smack into investor scepticism that Ford’s routine profits would insulate it from the disruptors. Hackett ought to be able to press home that the people who “work for Fords,” as they like to say, will be taken care of. But he’s probably going to have to get his hands dirtier than he expected.